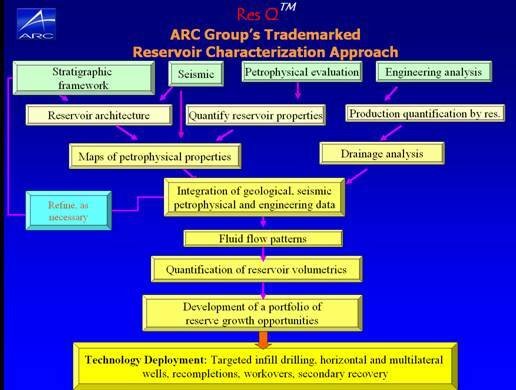 ARC Group’s 25-year experience in oil and/or gas field re-development and reactivation services is offered through our ResQTM approach to reservoir characterization. ResQTM is focused on increasing the recovery efficiency of mature oil and gas fields through thorough integrated reservoir characterization. ResQTM is based on the determination of reservoir architecture as a framework within which to evaluate petrophysical, production, saturation, and production data. Recent advances in industry’s understanding of sequence stratigraphy, depositional systems, diagenesis and porosity evolution, geophysics, and production analysis—much of which were pioneered by our ResQTM technical staff—have made reservoir characterization an extremely sophisticated enterprise. Principal ResQTM reservoir characterization services are to delineate the location and the volumes of original and remaining oil and gas reserves, and to develop the appropriate advanced recovery strategies for maximizing recovery efficiency in these reservoirs. Critical to this effort is identification of primary and secondary fluid flow paths, as well as the characterization of intrareservoir flow. Detailed knowledge of regional and local structure, genetic sequence-stratigraphic stacking patterns, reservoir lithofacies architecture, diagenetic overprint, and resulting reservoir compartments, combined with production information, are essential ResQTM components in achieving the goal of increased production. Our ResQTM approach is a multi-task workflow program (Figure 1). The following is a discussion of ARC Group’s services that are provided to the client both internationally in the clients’ offices and/or at our head offices in Austin, Texas. This overview of ResQTM services is provided to the client prior to beginning the program so that both the client and ARC Group can define the pathway that will be followed from the beginning of the project including milestones to be reached and scheduled tasks to be accomplished. In this way, both the client and ARC Group can monitor project progress. Figure 1. ARC Group’s ResQTM approach will define the flow paths and activities planned in field characterization studies. ResQTM Service Activity I: The structural and stratigraphic framework of the field area is defined and quantified. Because reservoir attributes and drainage are facies controlled, their three-dimensional extent and distribution will be governed by facies architecture. Definition of facies composition and extent (reservoir architecture) facilitates prediction of the spatial arrangement of reservoir properties and the location of the original (and remaining) oil and/or gas in the field. This activity integrates stratigraphic, sedimentological and seismic analyses. ResQTM Service Activity II: This part of the project is designed to delineate and quantify the residency and volume of oil by delineating spatial variation of petrophysical attributes—in particular, permeability, porosity, oil/gas saturation and hydrocarbon pore volume. ResQTM Service Activity III: The specific objective of the production-engineering phase of the study is to determine primary and secondary fluid flow trends through development of pressure, watercut, and cumulative production maps of completion intervals. These maps support the development of optimum recovery strategies. ResQTM Service Activity IV: In this activity all data and interpretations are integrated into a quantified geological, geophysical, petrophysical and engineering model of the reservoirs. The integrated model will be the basis for the construction of a geologically constrained numerical model of the reservoir. ResQTM Service Activity V: In this activity the quantified reservoir model determined in Activity IV is used to determine a multi-component portfolio of reservoir development opportunities including recompletions, new infill wells, advanced drilling technologies such as vertical and multilateral wells, and secondary recovery. This phase of the study involves stratigraphic, sedimentological and seismic analyses of the targeted reservoirs. The purpose of this activity is to identify the stratigraphic and structural architecture of the area through detailed seismic and stratigraphic study; the integration of the results of these studies; and the use of seismic attributes to constrain the mapping of the reservoir system at the exploration, field and between-well scale. A series of stratigraphic and structural cross sections are constructed and used to determine the stratigraphic framework complexity. Correlation is based on sequence stratigraphic characteristics, with an emphasis on through-going shale sections that correspond to condensed sections (equivalent to maximum flooding surfaces) and to unconformities. Particular attention is given to sediment stacking patterns and to identifying genetic units. Well-based sections and the associated tops and fault cuts are tied to equivalent seismic data sections to identify fault and sedimentary stacking patterns. Sandstone content and depositional trends are mapped within each of the correlated intervals established in the sequence stratigraphic framework. Depositional environments interpreted from core descriptions are calibrated to petrophysical log patterns and interpolated between cored wells. Depositional systems tract architecture and reservoir stacking patterns are identified. Map products include net sandstone-isopach maps and log-facies maps for delineation of depositional facies for each of the major reservoir intervals. Mapping of sedimentological facies is constrained by seismic attribute maps. Net sand and log facies mapping of all reservoirs. The structural framework is determined by integrating well log correlations with available seismic data. Based on data available, all 2 and/or 3 D seismic data is interpreted. Structure maps are prepared for all principal reservoir surfaces. Mapping in time and depth of seismic horizons. To the extent the petrophysical data allow, the time-tested petrophysical analysis procedure and services that we apply consists of the following primary objectives. This step is of critical importance as it is the basis for all aspects of resource quantification. Stratigraphic and areal variation in petrophysical properties are cross correlated with facies architecture to identify reservoir flow barriers. The goal of the production engineering activity is to quantify volumes and locations of original oil in place, both areally and by reservoir, in order to develop a predictive reservoir flow model based on the reservoir facies tracts determined in Activity 1. Production trends such as time-series analyses of production, pressure and watercut information are critical in determining fluid flow paths in the reservoir. Should sufficient data be available, by-well production are related to reservoir facies using petrophysical attributes. Engineering analyses of pressures, fluid flow (oil and water) and production volumes, within the context of the geological framework, are the major focus of this activity. Relate well histories (completion histories, workovers) to historical production curves. Update production database in OFM based on revised correlation framework. Compile summary tables of petrophysics and cumulative production per reservoir and per well. The primary goal of this stage of the investigation is to use the geologic framework and resource interpretations to identify those parts of the targeted field that are most prospective for maximizing production through waterflood redesign, the drilling of new conventional wells, designing advanced drilling scenarios, and recompleting existing wells. Resource-targeted infill locations are optimized for either conventional vertical wells or advanced technologies such as horizontal, deviated, or multilateral wells. We also evaluate existing wells to determine which oil/gas productive zones have “oil/gas-behind-pipe” and are therefore candidates for recompletion. The basis for the development of the portfolio of advanced recovery strategies are maps of hydrocarbon pore volume (SoPhiH) for each reservoir, which are developed through synthesis of the results of the geological analysis (Activity 1) and the petrophysical analysis (Activity 2). Sand and facies distributions, determined in Activity 1, guide the mapping of SoPhiH, original oil/gas in place, and watercut trends (determined in Activity 3) for each reservoir. This activity, integration of all results, is the most important of activities carried out in a reservoir characterization study, and is, of course, dependent on successful conclusion of the preceding activities. This integrated reservoir model developed through ResQTM applications can become the foundation for numerical modeling of reservoir performance. Estimation of original volumes of oil/gas in place by reservoir and fault block. A monthly summary of activities, including progress toward key milestones, is provided at the end of each month. A draft of this monthly report is made available for review prior to the end of the month and is finalized by the end of the month. Subtasks to be completed during the following month are included in the monthly report. A comprehensive final report, including digital copies of all interpretative displays, is developed at the conclusion of the project. A two—day technology-transfer presentation at which the Team will summarize the results of the project, and discuss at length recommendations for the development of the field, is presented on site at the conclusion of the project. ARC Group offers a depositional systems-based approach to exploration play analysis. In our approach, we integrate 2-D and 3-D seismic investigations and interpretations with interpretive depositional systems analysis from well log and cores supported by paleobathymetric information from paleontological analyses to determine the optimum conditions for frontier exploration plays. Our trademarked ResQTM methodology allows us to define play concepts and through integration of petrophysical data and engineering analyses identify those areas of optimum predicted reservoir quality. Our play analysis integrates sedimentological, seismic, petrophysical and production data into a holistic predictive model of the basin or genetic interval of interest. Such play analyses have been undertaken in the Burgos, Salinas, and Comalcalco Basins of Mexico.